Where to Buy Diehard Biorush Fe, Diehard Biorush Fe chelated EDTA Root Growth Stimulant - Lb - $26.95 for Sale with Fast Free Shipping! 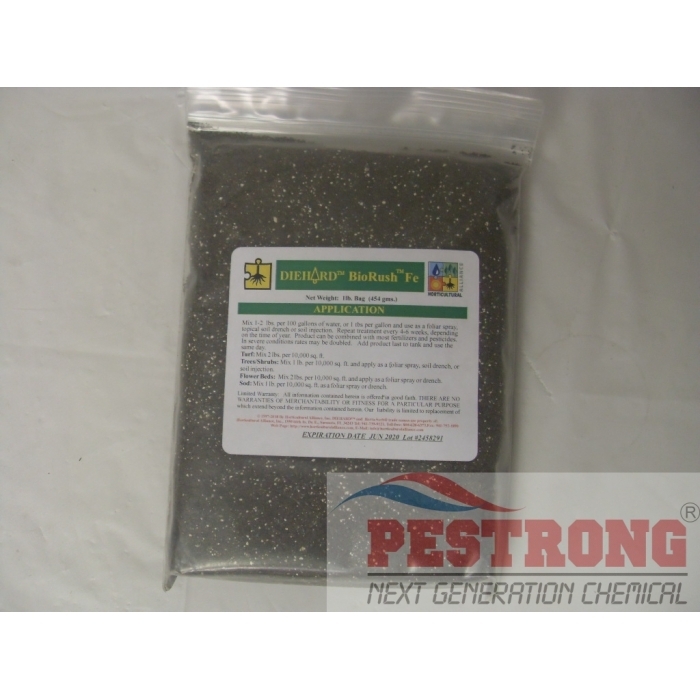 Diehard Biorush Fe chelated EDTA Root Growth Stimulant - Lb is a full water soluble micro nutrients with nitrogen fixing, phosphorus solubilizing and growth promoting beneficial bacteria packaged in pre-measured, labeled bags for easy use with tank sprayers. The product contains humic acid extracts, soluble sea kelp, and essential amino acids to "energize" the microbial activity in the ground and promote cell division and lateral bud development as well as delay the aging process of plant tissue. All these factors are well known to provide major benefit to plants promoting vigorous root growth and the over-all general condition of the plant environment. RATE: mix 1 -2 lb per 100 gallons of water or 1 tbs per gallon of water with foliar spray, topical soil drench, or soil injection. Turf: 2 lbs. per 10,000 sq. ft.
Tree&Shrubs: 1 lb. per 10,000 sq. ft. Flower Beds: 2 lbs. per 10,000 sq. ft.
Sod: 1 lb. per 10,000 sq.ft.